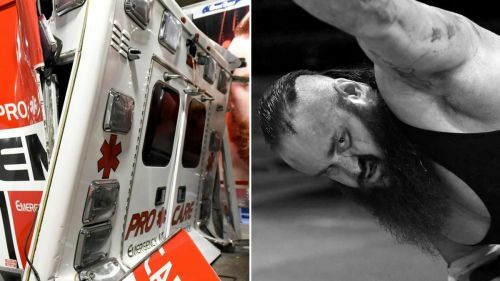 How did Braun Strowman walk away alive from some of these attacks? Braun Strowman is a force to be reckoned with. Even when compared to the other monsters on the Raw roster, he stands out as far more fearsome than all the rest. He is 100 lbs heavier than Brock Lesnar as well as more than a decade younger than The Big Show. Being able to size up against any of his most intimidating peers makes the potential for carnage that much greater. Oftentimes, this leads to near-deadly tactics used by him or his opponents. In his still young career on WWE's main roster, "The Monster Among Men" has nearly killed or almost been killed multiple times. These moments have made for some of the most riveting spectacles in modern pro-wrestling even though it's hard to believe that anyone could survive some of these stunts. Whether it's assault by ambulance, the misuse of a medical gurney, or an unfair four on one attack ending inside the back of a dump truck, there's no denying that charges should've been pressed after at least some of these attempted murders. On the final RAW before Payback 2017, Kalisto took on Braun Strowman in a Dumpster Match. Shockingly, Kalisto scored the win after kicking his opponent off the apron while positioned above the dumpster. In the moment, Corey Graves stated on commentary that he had a feeling that the win was the worst possible thing that could’ve happened to Kalisto. He was right. Strowman viciously beat down the man who just defeated him, stuffed him inside the dumpster, then wheeled it to the top of the entrance ramp. After a brief moment of contemplation, Braun pushed the dumpster off the top of the ramp as the commentary team responded with concern for the little guy. While this action does count as a threat on a wrestler’s life, it does fall a little short when compared to the infamous dumpster off the entrance ramp angle between the New Age Outlaws and Cactus Jack & Chainsaw Charlie from February 1998. There was a considerably steeper drop for Foley & Funk to survive on that occasion. Someone must’ve told Kalisto to walk this one off because he was back in action in a match against Strowman again two weeks later.